The pressure builds as we wind down the Top 100. We here at the Redbird Daily have enjoyed bringing this project to life and we hope you have enjoyed going back in time with us. I’ve had the pleasure of covering some of my favorite former Cardinals on this list. From Tom Herr and Bob Forsch to Keith Hernandez, Todd Worrell and Ozzie Smith, the list has allowed me to reminisce and hopefully I was able to do justice to their great careers. With my last entry onto the list, let me tell you about a pitcher so great he forced baseball to change their own rules. 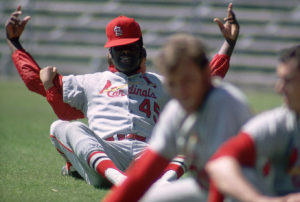 Number three on our list, Bob Gibson. He was the greatest pitcher in Cardinals history and arguably the best in baseball history. The Cardinals record books would support those claims, as he is the franchise leader in wins (251), complete games (255), strikeouts (3117), shutouts (56), and innings pitched. He is also second in games pitched (528) and tied for ninth in ERA (2.91). A first-ballot Hall of Famer and one of fifteen former Cardinals to have their number retired, Gibson was also an inaugural member of the Cardinals Hall of Fame in 2014. The phrase “Heroes are made in the postseason” most likely originated from someone researching the stat-lines for Gibson. The two-time World Series winner was awarded series MVP in both the 1964 and 1967 championship seasons. 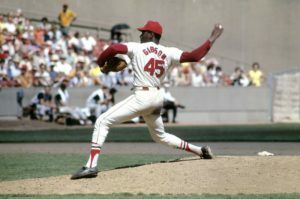 The 1967 MVP and Series win seemed unlikely for Gibson and the Cardinals in July of that year. A line drive of the bat of Roberto Clemente broke a bone in Gibson’s right leg. Returning in an astonishing 52 days, Gibson pitched the Cardinals pennant-clincher on September 18th. In the Cardinals win over Boston, Gibson went 3-0 with three complete games, 26 strikeouts while posting a 1.00 ERA. The impressive career playoff line for Mr. Gibson goes something like this: 7-2 record, 1.89 ERA, 8 complete games, 2 shutouts, and a video game like 92 strikeouts in 9 postseason games. The greatest pitching season in modern baseball history. Gibson established an all-time record low ERA of 1.12 including an unbelievable 13 shutouts while striking out 268. The numbers were good enough to give Gibson the National League Cy Young award as well as N.L. MVP. Gibson went on to win two more postseason games including a 17 strikeout performance in game one against the Detroit Tigers. Following the 1968 season, Major League Baseball decided to lower the mound height from 15 inches to 10 inches to generate more offense. It was an unprecedented move in professional sports that has become known as the “Gibson Rule”. A two-sport star at Creighton University, Gibson played for the Harlem Globetrotters before arriving in St. Louis. He is still in the Creighton top five list in free throws made (418) and free throws attempted (575) while averaging 20 ppg. Gibson was known as a complete pitcher, winning the NL Gold Glove nine times while hitting 24 career home runs (not including 2 World Series homers). Intimidating, intense, competitive and downright scary are all things read while researching Gibson. Everyone has Bob Gibson stories to share whether they are first hand passed down through the years. We seem to get a few more every year that Tim McCarver is on the Cardinal broadcast. I wanted to share a couple of stories that I’ve heard over the last few years. A friend of mine is a Tulsa Police Officer and a dedicated Cardinal fan. While attending the 2004 World Series in St.Louis, his group had a table at Mike Shannons prior to game three. Sitting in close proximity to Red Sox fans one of which informed him that Gibson was incredibly overrated. This lead to an argument that ultimately had to be mediated by hotel security. Being an out-of-town cop was probably the factor that allowed him to attend that night’s game. That will do it for my contributions to the Top 100 St. Louis Cardinals. Stay tuned as we introduce the final two stars this weekend.